The Faithful Foodie » Thanksgiving Recipe Roundup! I thought it’d be fun to do a bit of a recipe roundup for Thanksgiving and I wanted to share my fall tablescape as well! It is one of those ceramic firepots that burns a gel-type clean fuel so it can be burned indoors or out. I loved the colors of this one and just placed some greenery and fruit around the base for a simple but nice tablescape. Many certainly have their Thanksgiving traditions . . . my family sure does. 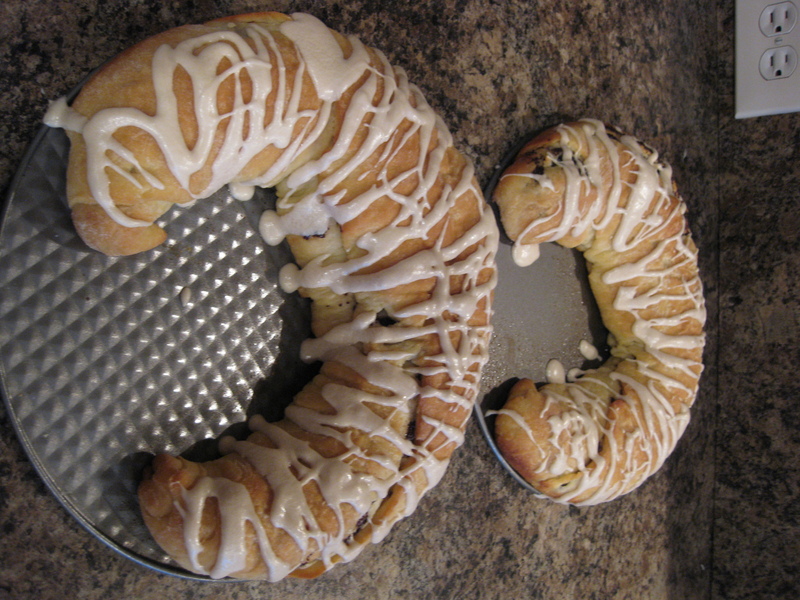 We always begin our day with poppyseed coffeecake that has now been made for several generations. In fact, this is the tradition for Thanksgiving, Christmas, and Easter! It takes a little work but it sure is delicious!! We also have to have our breakfast casserole. For years my family insisted on the same casserole, but last year I took a risk and tried a new one, Green Chile-Sausage Casserole. Surprisingly, it became the new breakfast casserole of choice. It just goes to show that some traditions can change!! Now, even though we eat twice as much breakfast as we normally do, we still have to have some snack food for munching while watching the Macy’s Thanksgiving Day Parade. In all fairness to the family, we don’t really have lunch and then have our big dinner at about 5:30. A must-have snack is the Zesty Ranch Pretzels. Even and the two and three year-olds love’em! They’re so easy and cheap to make, as well. I have to confess that I do nothing fancy with the turkey. I stuff it with a few stalks of celery and an onion that have been cut into chunks, season it with Lawry’s Seasoning Salt & fresh ground pepper, throw it in one of those Reynolds cooking bags and follow the directions that come with the bags and that’s it! The turkey turns out golden brown, moist, and all the lovely juices remain from which to make a bunch of gravy. My family can never have too much gravy! As far as side dishes go, we have the usual mashed potatoes, stuffing, cranberry sauce, etc. My son-in-law makes a great corn casserole that we always have, as well as, the standard green bean casserole. Depending on how many people we’re having, I also add another vegetable casserole or two. One of my favorites is the Cheesy Vegetable Bake. 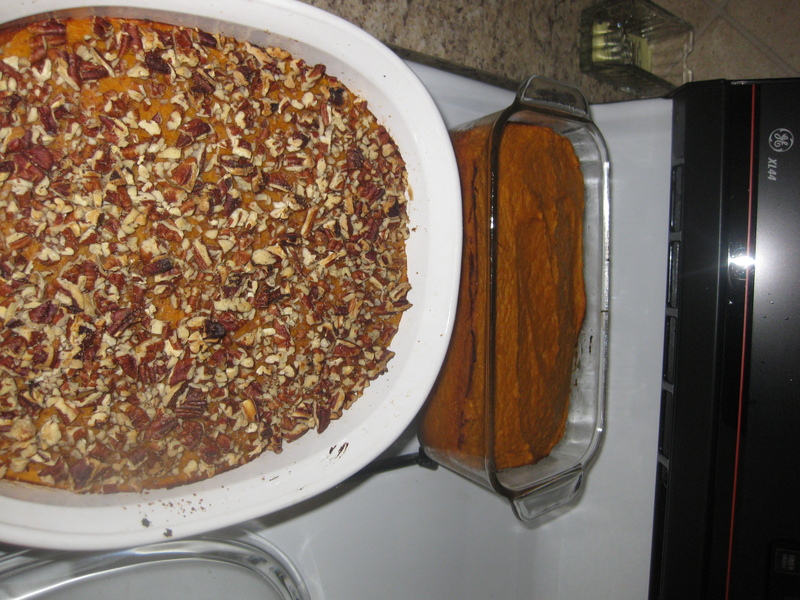 Another favorite side dish is Sweet N’ Spicy Sweet Potato Casserole! It has just a touch of cayenne for a hint of spicy along with orange juice and other spices that are a great combination with the sweet potatoes and the crunch of pecans on top! Last of all, is dessert! We have the standard assortment of pies with whipped cream and vanilla ice cream. This year my niece is bringing a berry pie and I just may make a pan of Pumpkin Bread Pudding along with Caramel Rum Sauce for drizzling! I hope that all of you have a Thanksgiving filled with family, fun, and friends! Blessings to all of you!! Yumo!!! All of your selections sound wonderful. Of course I really miss your poppy seed coffee cake!!! I may have to try it myself. I cant wait to try the Sweet and Spicy Potato Casserole Sue. It looks so deicious. The website is great! Thanks! I made it for a family event a while back and folks really liked it.